Sensitive components such as microphones must be hand soldered or socketed because the Mylar diaphragm inside the microphone would melt if it were reflow soldered directly to the circuit board. A socket eliminates the expense of hand soldering. The Mill-Max socket is designed for bottom entry, eg., the microphone plugs through the circuit board into the socket on the opposite side. This feature achieves a low microphone profile suitable for "shirt pocket" sized phones. Sockets are supplied on 12mm wide tape (6,500 per 13" reel) to feed industry standard "pick and place" assembly machines. 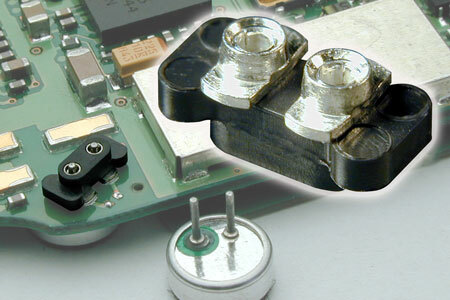 The assembly and soldering technique for this socket is called "intrusive reflow". Intrusive reflow (also called "pin-in-paste") is a technique of using conventional through-hole components in a reflow soldering process. The leads of the component are placed into plated-through-holes in the circuit board (solder paste has previously been screen printed on pads adjacent to the holes) and the board is reflowed in the same pass as other SMT components. The solder paste will fill the PTH and achieve a solder joint as reliable as wave soldering. The volume of paste required to fill each hole can be increased by "overprinting" paste on the solder mask adjacent to the hole. The primary benefit of the Mill-Max design is that the precision-machined receptacles have a large entry target, which permits automatic insertion of the microphone during final assembly of the telephone.